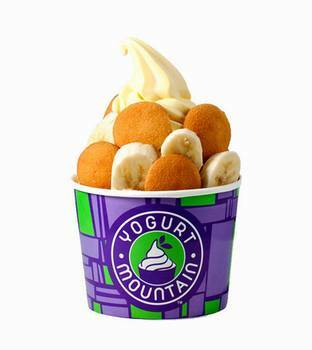 Yogurt Mountain welcomes you to a brand new frozen treat concept unlike anything you've ever experienced. With cup in hand, proceed down the self-serve mosaic wall, mixing any of the authentic flavors of yogurt and sorbet. Next, access the toppings bar and crown your selection with the freshest of fruits, cereals, nuts, candy, and sauces. Predetermined portions are a thing of the past! Since you pay by the ounce, you can have as little or as much of everything as you want!